So, when working on badges, The Artist needs to laminate things. So we ordered a Purple Cows Hot and Cold Laminator (available at amazon ). It is a cute little thing which does not look businesslike in the least. Overall, I am impressed. The warm up light cuts off a little soon (letting it go a few additional minutes seems to give better results), but otherwise it has seemed rock solid. I managed to get it on sale for about $20, but compared to other laminators with reasonable reviews, it is still a bargain at full price. We will see how long it lasts, but for the occasional stuff we are doing it should be great. Sorry for missing a few updates everyone! Apparently the wordpress iOS app managed to break itself over the weekend. Sorting out that the problem is not on our end took a bit of time. Now I need to retrain The Artist so she can post through the webpages instead (at least as long as the app is broken). I will try to post more real content later on tonight. Since it is a FAQ recently, I figured I would post this. 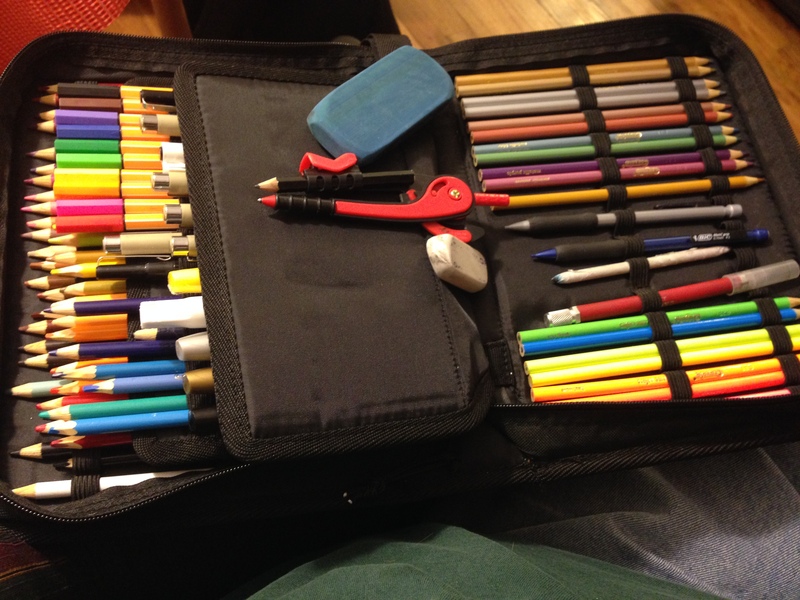 It holds every colored pencil, pen, and paint marker she uses with space for all the little erasers and stuff shoved in there. The price seems high, but there was nothing else on the market that seemed to make it work. Just as a warning, it is bigger than it seems. It is about the size of a 1000 page hardcover books, which makes it portable, but this is not going to fit in a pocket, or even many purses. She has a purse that fits it, but it is a close thing (and contributes to the 10lbs that purse weighs). If you are making badges you need a slot punch. This is not news to people who have been doing this for a while. For those of us getting into the business, it is good to know that this is apparently the unicorn of office supplies. Well, we finally put in our first order for business cards. The recommendations I saw on twitter for art related cards was to go with moo.com. After the order they give a link to refer people. I am going to put it up here for anyone who wants to save 10% ordering from them. I will make sure to post how they come out when we get them.